It's a story we all share. It's what brings us together as a people, and yet, when it comes to the great American story, it turns out that we know so very little of it. Sarah Palin's lack of historical knowledge was painfully exposed on her recent One Nation bus tour. 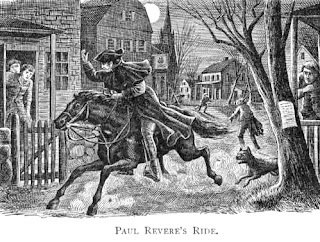 At the Old North Church in Boston, Palin gave details of Paul Revere's famous ride that erroneously included bells and gun shots. And while the media and her critics were quick to point out her mistakes, Stephen Colbert put it in perspective when he said, "without her, no one would have checked into what actually happened." 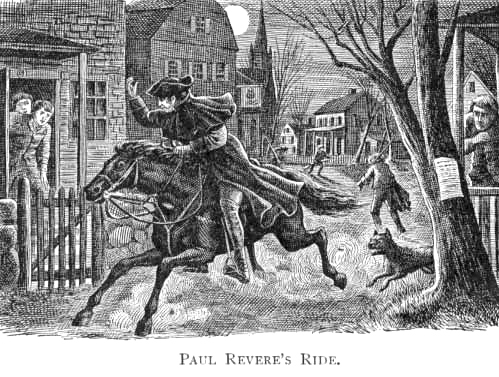 A depiction of Revere's ride sans bells and gun shots. But, Palin isn't the only one who's lacking historical knowledge. Elementary, middle school and high school students don't fare much better. It seems that history is not a priority any more. According to The Wall Street Journal, "The results from the National Assessment of Educational Progress revealed that U.S. schoolchildren have made little progress since 2006 in their understanding of key historical themes, including the basic principles of democracy and America’s role in the world. "Only 20% of U.S. fourth-graders and 17% of eighth-graders who took the 2010 history exam were "proficient" or "advanced," unchanged since the test was last administered in 2006. Proficient means students have a solid understanding of the material. "The news was even more dire in high school, where 12% of 12th-graders were proficient, unchanged since 2006. More than half of all seniors posted scores at the lowest achievement level, "below basic." While the nation’s fourth- and eighth-graders have seen a slight uptick in scores since the exam was first administered in 1994, 12th-graders haven’t." When I returned to college at midlife to pursue my journalism studies, a study of American history was one of the first things I included in my personal curriculum, regardless of university requirements. It was quite simple. I felt -- and still feel -- that a journalist should have a good basic knowledge of where America has been in order to understand its current role on the world stage and report on today's events in context. My American history classes were well worth taking. My overview of our common story became a timeline for my other studies. I often referred back to my history notes for insights into women's studies, journalism, literature, law and ethics. Back in the '80s, Billy Joel inspired a study of history with his hit song "We Didn't Start the Fire." In the days just preceding wide access to the Internet, Joel, a self-proclaimed history buff, strung together historical events in a catchy, rhyming sequence that caught our attention and had us heading for our history books to find out what he was singing about. I remember school children making elaborate time lines to match the song -- and they were loving it! Is it possible to reignite that spark for knowledge? I'd love to see Joel pick up where he left off and do an updated version of the song, and perhaps include a little HERstory for good measure. Cherie's challenge: Start naming significant events since 1989. See if you can weave them into Billy Joel's classic tune. "Don't blame Palin for lack of history" by Leonard Pitts Jr.